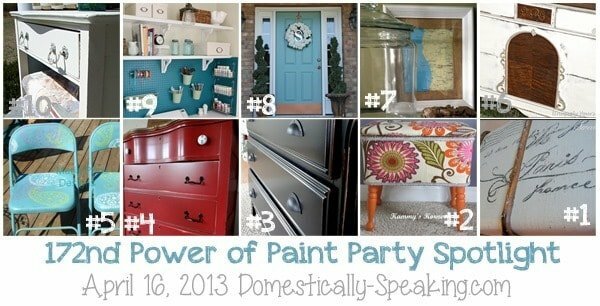 Welcome Paint Lovers to this week’s Power of Paint Party… a party all about PAINT and only PAINT!!! Can’t wait to see what you guys have this week to share, but first let’s check out last week’s amazing Top Ten Spotlight! this gorgeous painted trunk turned table. #1… This is a PAINT party… so pretty please, link-up only paint related projects. #2… I’d love for you to put my PoPP button or a text link in your blog post… that way others from your blog can check out all the paint projects too. #3… Share the Love… visit the other paint pals. By linking up you are releasing me to feature your paint project, with proper link-backs of course! Don’t forget… you can submit your paint project over at Power of Paint (my other blog) to have it featured. Love this? Then don't miss out! Thank you! You have successfully subscribed to our emails. Sign-up to get the latest from Domestically Speaking. Just select which emails you'd like to receive below! Hello, great party! I saw that it is about only paint related projects after I linked my ikea hack. I don’t know how to remove it, please do. Thank you so much for hosting! I love these parties…so many talented people out there and so much inspiration. Also, thank you for featuring my “no doors” project this week! I’ll be linking again soon. Thank you so much for the party! Thank you so much for both features Maryann! Just love a paint party–thanks so much for hosting!! Welcome!!!! I'm Maryann... I love tackling DIY projects, painting any and everything I can get my hands on, fluffing my home and constantly moving furniture & I do my best to impersonate a chef and baker. I hope you enjoy looking around! Thank you! You have successfully subscribed to our emails! Sign-up for now so you never miss out! Select below what you want to receive from me!